ACTIVITY 2: Above are two images representing the crusades. The image on the left is a roundel from the stained glass Crusader Window of the Abbey Church of St Denis, ca. 1158. On the right is an illuminated medallion from the bible moralisée, Codex Vindobonensis, ONB codex 2554, ca. 1220. Notice the great similarity in imagery. ​Read the profiles on each of these forms below. In 1729, French Benedictine monk Dom Bernard de Montfaucon published Les Monumens de la Monarchie francoise, a record of the lost monuments to French art. Included in the publication were twelve engravings depicting the First Crusade from a choir window of the abbey Church of St Denis. None of this glass has survived, but there are two comparable glass medallions in the Raymond Pitcairn collection at the Glencairn Museum (Figs 1-2, below). Sparse though the evidence is, the relationship between the engravings and the two medallions has been noted and supports the hypothesis that all fourteen panels were assembled in a single window. The two medallions from the Pitcairn Museum first appeared in the literature more than a century after Montfaucon’s publication. 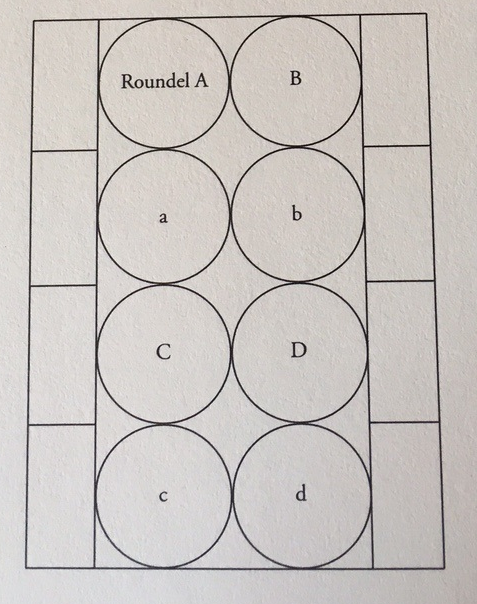 In the 1830’s when the other twelve glass panels had disappeared, the Pitcairn medallions were installed in the axial chapel of the abbey church. A subsequent restoration of the church sent the medallions into the art market and entered the collection of Raymond Pitcairn in 1923. The first Pitcairn medallion (Fig 1) portrays a king on horseback in the midst of an equestrian army. An inscription may have once identified the scene, but the lettered glass that now defines the ground line are stop gaps with no relationship to the original panel. The head of the king and a large part of his body are also the products of a thirteenth-century restorer, whose hand can also be discerned in the head of Charlemagne from an engraving drawn for Montfaucon. The second Pitcairn medallion (Fig 2) depicts nine figures seated in groups of three. The central group is receiving three crowns bestowed with heavenly sanction from above, as their six companions already crowned gesture to signify their accord. As a complement to the first medallion of the king and his warriors, this second panel portrays the glorious consequences of holy battle representing the martyred heroes. Thus the iconic scene of the two panels together is progressive, rather than static. The window presumably was comprised of a series of pairs which followed a logical historical sequence in ascending fashion and portrayed in a progression from left to right, illustrating “effort” and “reward”. The window is organized into three iconographical clusters starting from the bottom: 1) two Pitcairn medallions which portrayed general themes of crusading, 2) two scenes rooted in the distant historical past based on Charlemagne’s legendary pilgrimage and crusade to the Holy Land, and 3) concrete results of holy war through ten scenes depicting battles and triumphs of the First Crusade. The Crusading Window of St Denis would have caused those who viewed it to ponder the glorious crusading victories of the past and their relevance to the present and future life of the Church. The message of the window would have been clear: the struggle to defend Christ’s faith and the land where he once lived would be long-lasting, but the effort of those who participated in that struggle would be rewarded with victory here on earth and, in heaven, by the crown of martyrdom which they would possess for eternity. 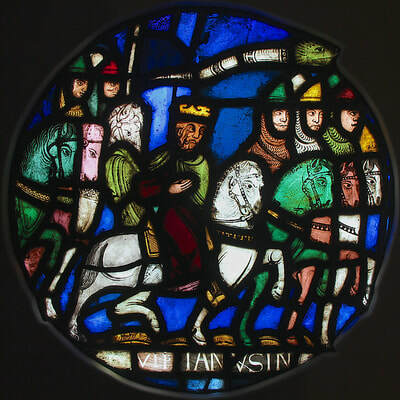 The Crusading Window of St Denis functioned as a monument which allowed the community to construct its own understanding of the Christian army in the east. Commemorating the sacred and mythic past, the stained glass provides a virtual layering of biblical, local and global meaning. Elizabeth A. R. Brown and Michael W. Cothren, “The Twelfth-Century Crusading Window of the Abbey of Saint-Denis: Praeteritorum Enim Recordatio Futuorum est Exhibito,” Journal of the Warburg Courtauld Institutes 49 (1986), 1-40. ACTIVITY 1: Read the two following excerpts regarding visual cultural production as valuable historical resources which enrich our understanding of the crusades. ‘Art and crusade’ has in recent years become a lively field of scholarly study. There are three major areas in which the crusade movement has been connected to medieval art. First, there are the architectural monuments and objects of art which were built and produced in the crusader states of the Levant. Usually referred to as ‘crusader art and architecture’, this is an area of study with a long tradition and a scholarly pedigree that reaches back well into the nineteenth century. Having strong links with the archaeology of the crusader states, research in crusader art and architecture has recently flourished, producing a number of important monograph studies including works on coins and seals. A second area of ‘art and crusade’ encompasses representations of crusades and crusaders in medieval sculpture and painting, i.e. books, murals and glass windows. Surprisingly, this is an area that has attracted very little systematic research to date. Nevertheless, some valuable articles have recently been published on individual aspects of the representation of crusades and crusaders in medieval sculpture and painting. Thirdly, there is the influence of the ideology of the crusade on the thematic contents of works of art that did not originate in the crusader states and do not actually depict the crusade or crusaders. In the past two decades, this has become a very lively and extremely interesting area of study, showing how the crusade indirectly influenced developments in medieval art and also illustrating forcefully how crusade ideology subtly pervaded medieval culture as a whole. Christoph T. Maier, “The bible moralisée and the Crusdaes,” in The Experience of Crusading: Western Approaches, ed. Marcus Bull and Norman Housely (Cambridge, 2003), 209-222. Scholars using images as primary sources for crusade culture certainly have not dismissed text-based critical study, but they have uncovered places where visual works reframe, exceed, or even challenge the textual sources. Indeed, at its core, the study of visual culture posits that visual images play a crucial role in the meaning-making of culture. As such, the contributions contained within this volume should not be treated as an “illustrated guide” to the history of the crusades. Rather this volume has sought cross-disciplinary approaches to a broad range of media in order to better understand not only how crusading was represented, reflected, or promoted in art and architecture but also how the very idea of crusading itself was visualized across time and space and how such visualizations presented their own views and agency. In this regard, the study of visual culture is closely tied to the very notion of visuality, which Whitney Davis has recently defined as the “symbolic form” of visual perception and/or experience. This pedagogical project is designed for newcomers to the field of crusade studies. As this field has grown increasingly interdisciplinary it has benefited from the recognition that textual and visual representations are not always parallel. Visual cultural products are a reflection of theoretical and social concerns which draw from textual and visual sources to express a complex set of ideas. 1) read two short scholarly excerpts concerned with visual cultural production as valuable historical resources that enrich understanding of how the crusades were remembered, understood, interpreted, and used. 2) look at two different examples of visual cultural products and observe how one form influenced the other. 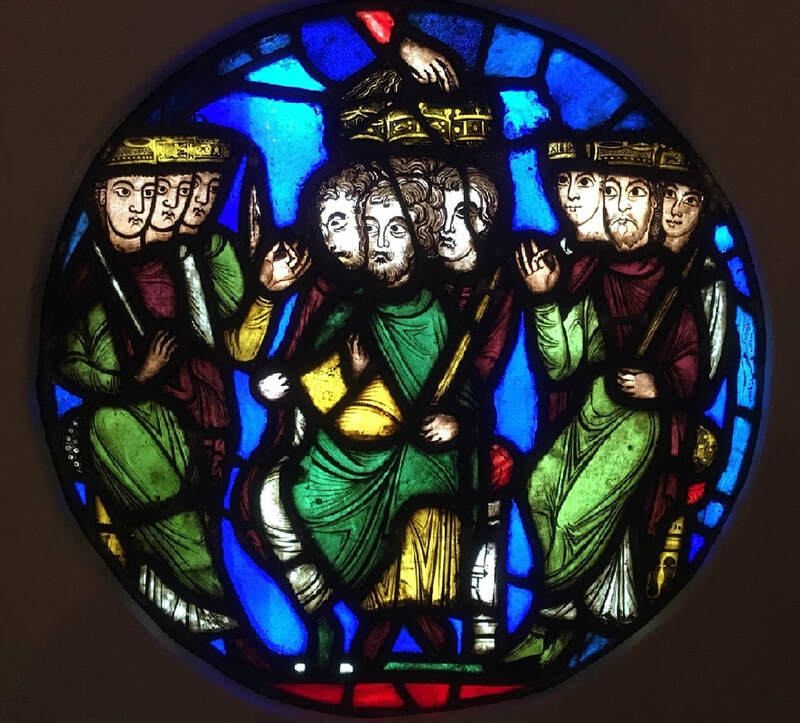 Students will look at the 12th century stained glass crusading window of St Denis and the 13th century bible moralisée, Codex Vindobonensis, MS 2554. 3) understand how these forms, though similar, were read and experienced differently- from the monumental and public stained glass window to the personal and private moralized bible. 4) search for two new examples of visual cultural products which make statements about the crusades and discuss the relationship between them and their function as crusade resources. Crusade ideology had an impact on the pictorial programme and the biblical exegesis of lavishly illustrated bibles originating as the bibles moralisées did in the second quarter of the thirteenth century under the influence of the French royal family. In one of the early bibles moralisées now at Vienna, Codex Vindobonensis, ONB codex 2554, the theme of crusading crops up in several places both in the pictures and accompanying texts. There seems to be an agreement that ONB codex 2554 was made between 1215 and 1230 for a member of the French royal family. John Lowden has argued that codex 2554 was probably produced in the early 1220’s on the instigation of noted patron of manuscripts Blanche of Castile, the wife of Louis VIII and mother or Louis IX. The period between 1215 and 1230, like the first half of the thirteenth century in general, was a time of great crusading activity both in France against the Albigensian heretics and elsewhere, and the members of the French royal family- past, present and future- were fervent supporters and active participants of the crusade movement. A cleric, or perhaps committee of clerics close to the French court was appointed to coordinate the compilation of the texts and creation of images. The library of the Abbey of St Victor seems a likely location, though the Royal abbey of St Denis and, or Augustinian Abbey of Ste Geneviѐve are also possibilities. Once the text were compiled, the director would have hired an artistic workshop to execute the illuminations. The director would have had to consult with the artists on a regular basis as no visual models existed for many of the biblical images. Many roundels adapt, manipulate or reuse gestures from other artistic cycles, such as the Theophilus Windows. In its present form ONB codex 2554 is far from what it must have looked like in the thirteenth century. Not only have an unknown number of portfolios been lost, but the original margins were also cut off at some point and the sequence of the quires was wrongly re-arranged several times in the nineteenth century and earlier. All the pages follow the characteristic layout of the bible moralisée with eight medallions in two rows each accompanied by its own explanatory text to the left or right. Each medallion illustrating a passage of the Bible is related to the medallion immediately below, which offers a moralizing interpretation of that biblical passage. In ONB Codex 2554 these pairs of medallions always follows a sequence from top left to top right bottom left to bottom right. In order to perceive the full meaning it is not only paramount to combine each image with its text, it is also necessary to look to each pair of biblical and moralizing medallions together, since the biblical precedent acts as a mold in which the moral message is formed. The meaning of the ‘moralizing’ interpretation usually only becomes entirely clear when set against the preceding biblical image and text. However, readers of the bible moralisée- the king and members of his court- would likely have engaged the manuscript in a thematic rather than linear manner, perusing the page and stopping at symbols, topics, or episodes that caught their eye. The bibles moralisées are in sum, relatively simple-to-read picture books whose images forcefully inform the reader. One thing that is made clear by the images is that the bibles moralisées is intended not so much to elucidate the meaning of the Bible as to utilize familiar biblical scenes to promote certain ideas, readings, and even clerical policies. The first direct reference to the theme of crusading in ONB codex 2554 appears on folio 4r (see below). In the second moralizing image (second from top on the right), we see the crusaders or Jerusalem pilgrims. Their status is clearly marked by pilgrim’s attire. The crosses attached to the cloaks on their right shoulders show them to be crusaders. They are walking away from a group of three adults, whose eyes and gestures follow the departing pilgrims. This scene is reminiscent of the way in which thirteenth-century crusade propaganda texts describe the relationship between crusaders and their families. There crusaders were said to have found it difficult to leave their families behind when departing from home. The emotional ties between husband and wife, father and children were said to make the crusaders reluctant to take the cross to leave on what was after all a journey of an uncertain outcome, including the possibility of death along the way. This is exactly what the crusaders in the medallion are doing. Not only do they leave their loved ones, but the artist also suggested that they had a special relationship with God- whom he placed in the little square above their heads outside of the medallion- by joining their heads and God’s hand with radiating lines. The crusaders are introduced as an example of people who follow God’s call to go on a journey which is at the same time physical and spiritual and above all penitential. In comparison with themes of Jews and Judaism, the theme of crusading does by no means play a dominating role in ONB codex 2554 or any other bible moralisée; its occasional appearance is incidental rather than programmatic. More systematic research- also into the influence of crusade ideology on the overall programme of the bibles moralisées- taking into account all the extant examples of the bible moralisée might well show that the crusade plays a much more prominent role in this genre than has so far been assumed. ACTIVITY 3: Understand how these forms were "read" and experienced differently. Look below at the reconstruction drawing for the Crusading Window of St Denis and the layout plan for bible moralisée. Though the similarity between the two is obvious, how the images were "read" varied. In the case of the stained glass, which was monumental in size, the images were read in pairs from the bottom up and from left to right. For Codex 2554, follow carefully the upper and lower case lettering guide and notice that the images were paired from top to bottom and from left to right. QUESTION: How would the experience have differed between the monumental and public stained glass window compared to the personal and private experience of reading a manuscript? Please note your thought and be prepared to discuss them orally. ACTIVITY 4: Search for any two examples of visual cultural products which make statements about the crusades. Please record all relevant identifying information for the objects. If possible, photograph, or copy the images. Based on the reading excerpts and examples above, write a page discussing the relationship between the two products and their function as crusade resources. Be prepared to discuss your findings orally. Clark Maines, “The Charlemagne Window at Chartres Cathedral: New Considerations on Text and Image” Speculum Vol. 52, No. 4 (October 1977), 801-23.